Canadian Sales Tax Calculator will calculate all three types of Canadian sales tax, GST, HST and PST. Canadian Sales Tax Calculator is also available with Java source to download. Canadian Sales Tax Calculator is designed to be cannibalised, so that you can use whatever parts of the calculator source code you want in your own code, e.g. a shopping cart. There are notes in the source on precisely how the taxes are calculated. Calculates Canadian sales taxes: GST HST and PST. * HST created by combining 5% GST with 7% PST. In contrast, the other provinces using HST all have a 13% HST. * Ontario switched to HST on 2010-07-01. * Quebec nomimal rate will increase to 8.5% on 2011-01-01 and 9.5% on 2012-01-01. 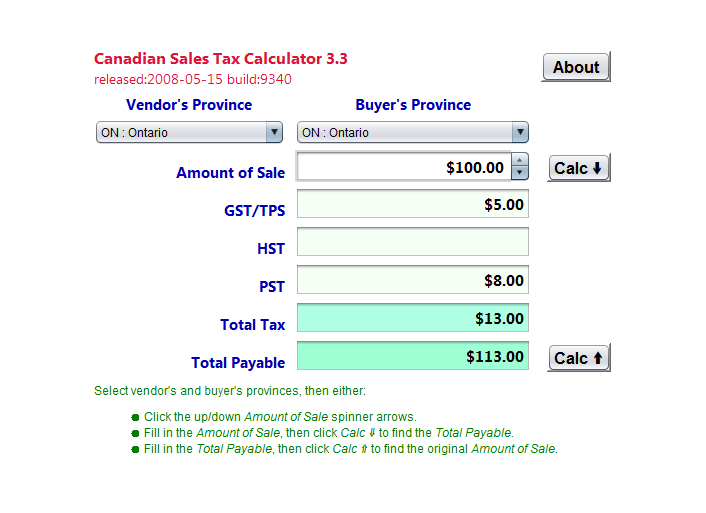 Canadian Sales Tax Calculator is also available with Java source to download. Canadian Sales Tax Calculator is designed to be cannibalised, so that you can use whatever parts of the calculator source code you want in your own code, e.g. a shopping cart. There are notes in the source on precisely how the taxes are calculated. You can also configure your copy of the downloaded program to start up with whatever province you like. Qweas is providing links to Canadian Sales Tax Calculator 3.6 as a courtesy, and makes no representations regarding Canadian Sales Tax Calculator or any other applications or any information related thereto. Any questions, complaints or claims regarding this application Canadian Sales Tax Calculator 3.6 must be directed to the appropriate software vendor. You may click the publisher link of Canadian Sales Tax Calculator on the top of this page to get more details about the vendor.